Vancouver actor Grace Dove has done her fair share of auditions. But there was one audition that changed everything for the hard-working thespian as she was able to land a plum role on one of the biggest films of the year. The Revenant, which opened across Canada earlier this month, has received rave reviews and accolades, including three Golden Globes for Best Picture, Best Director (Alejandro González Iñárritu), and Best Actor (Leonardo DiCaprio). The film was also just nominated for 12 Academy Awards, not too shabby. Because it was mostly shot in Canada, there were many Canadian actors and production crew that worked onThe Revenant, including a few who also got Oscar nods. Grace Dove was able to take some time away from filming her television show Underexposed, which is currently enjoying its third season on APTN, to chat about her role as Hugh Glass’s wife in The Revenant. First off, I need to ask you, whereabouts are you from and when did you decide to move to Vancouver? My family is from the Cariboo region, Canim Lake Indian Band, and I was born and raised in Prince George. I bee-lined it to Vancouver pretty quick after high school and moved to study acting. I’ve been there for a number of years now working in the industry. I think I always had it in me. I was always a performer. I always loved attention and all of that was confirmed in my life when I was 11 after I booked my first television show. Ever since that first time I was on TV, I knew it was my calling. So you go from doing TV and a couple of smaller films, to all of a sudden acting alongside Leonardo DiCaprio on one of the biggest films of the year? How cool is that? I don’t know exactly how it happened. I put in the work and for me it honestly feels like a lifetime coming. I’ve just been grinding away at this. I think I’ve always had a vision and a dream and it all just happened for me. Explain to me how it all went down? You obviously auditioned for the role, how stoked were you to find out that you got it? I had auditioned for The Revenant about a year before I auditioned for that specific role (Hugh Glass’s wife.) I came back and auditioned again for the role, and I still didn’t find out until months later. When I finally did get the call I remember I was walking down Commercial Drive in Vancouver, and I had already let that audition go. When you do auditions, you got to let them go, otherwise you’ll be thinking about them too much and you have to keep moving forward. More often than not you’re not booking anything. I went years without booking anything. When I finally did get this role I started dancing, crying and laughing. I knew that it was going to be a game changer. Being the nonspeaking spiritual focus of the film, what was the audition process like with Alejandro Iñárritu? It was so cool. This audition was like nothing I had ever done before. It wasn’t just a bunch of lines or a set dialogue, there were so many different layers within the audition, which makes sense coming from someone like Alejandro. I knew he wasn’t going to do it the normal way. He really had some questions and a process that dug into who I was, not whether or not I could act, but who was Grace and what could she bring to the role? All of your scenes with Leo have this intimacy to them, including the scene where you float above him. What was your preparation like? I had to go in there extremely open without any expectations. Just like the audition process and even the filming process, I didn’t know what exactly I was getting into. I prepared myself physically, emotionally and spiritually to be as open as possible so I could take direction, feed off my surroundings, and feed off my relationship with Leonardo within the scene. Obviously it’s a period piece and so I was trying to connect to a layer of my ancestry as well. A lot of time First Nations people aren’t depicted fairly in film. Were you happy with how you and other natives were portrayed in this film? Hollywood has definitely come along way. In the past there has been a lot of misinterpretation and misrepresentation of First Nations people. However, in this film, I knew from the beginning the level of respect Alejandro showed toward me personally and so I felt really comfortable. I feel with the way it turned out and the love that Leo’s character had for me in the story, that in my mind that already showed a level of equality there. I was very happy and absolutely thrilled with the overall level of respect that was shown to me and the character. How crazy was it to arrive on set on the first day and start working with such a fantastic and well known actor in Leo? You must have been pinching yourself. It was crazy. I think that’s why this whole thing was meant to be. As an actor I always admired DiCaprio’s work. He has done so much and I really look up to him. But when I arrived on set there was no time to be nervous or to think about who he was. When it came down to it, it was about who we are in the script, who our characters were and what our relationship was all about. Right away it was about the work and I was able to focus and everything felt very natural. You weren’t nervous at all? Obviously so much of it was new for me, so there were moments where I was nervous. But I would look over at Leo and he would give me a look and he would always make me feel very grounded and calm. When Leo won the Golden Globe he acknowledged First Nations people in his acceptance speech. What was your reaction to that type of recognition for your people on such a big stage? For Leo to make such a statement, that just shows the level of his character that I already knew he had. It showed the respect that he has as a settler to this land, and as an environmentalist, he knows that First Nations people have always had a connection to the land, and that’s the kind of thing that drives him. It’s so cool because I think that this is a conversation that we need to have, and so that type of recognition is a powerful first step. 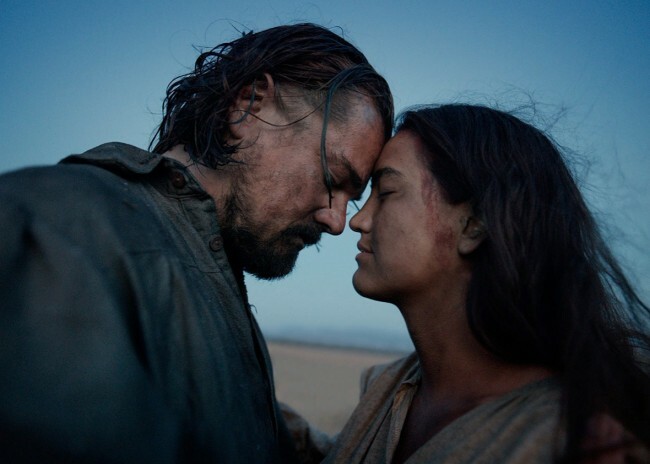 You are now done with The Revenant, what is Grace Dove going to do now? I’m still finishing up the TV show, so I’m still putting in the work everyday here. After that, I already have a call back and some big opportunities so it’s about picking the right script because I have no doubt that 2016 should be huge. You can follow Grace on Twitter @_gracedove, and check out her pictures at her Instagram account.